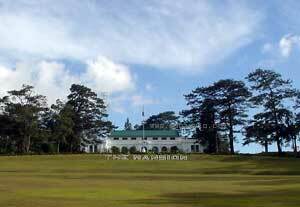 The Mansion House in Baguio City | Baguio Attractions | Go Baguio! The Mansion is the official summer residence of the President of the Philippines. It is located on the eastern part of the city along C.P. Romulo Drive (formerly a part of Leonard Wood Road) and right across from Wright Park. 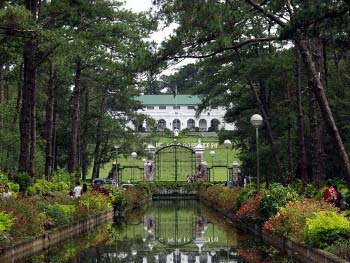 Older than the city itself, the Mansion is easily one of the most visited and photographed landmarks of Baguio. Formerly called the Mansion House, this stately building was built in 1908 as summer homes for U.S. Governor-generals who were the American administrators for the Philippines and was destroyed in 1945 during the battle for the liberation of the Philippines. The Philippine government later rebuilt and improved the structure in 1947 and since then it has been used by various Philippine presidents whenever they come up to Baguio City for their official visits and engagements. The Mansion once served as the seat of the Second Session of Economic Commission of Asia and the Far East in 1947. It has also been the site of first meeting of the South East Asia Union which was popularly known as the Baguio Conference of 1950, conceived and convened by Philippine President Elpidio Quirino. Inside the Mansion is a mini museum housing memorabilia and works of art collected over its years of occupancy by the former presidents. Within the compound and adjacent to the Mansion is a two-story building which serves as the official residence of the Philippine President in Baguio City and nearby is a small amphitheater. A contingent of Philippine marines maintains the security of this large compound and you will see a some of them manning the guardhouse at the vicinity of the gate. Any time of the year is good time to visit this Baguio attraction, and during clear days The Mansion is simply postcard perfect. When the President of the Philippines is not in residence, tourists are allowed to enter a little past the gates. One of course, should explore Wright Park which is right across The Mansion, and which is probably one of the most romantic spots in the whole of the Philippines. By car -- pass through Leonard Wood Road past Teachers Camp and Botanical Garden. When you reach Pacdal Circle, go towards the road which gently climbs uphill that is to the right of the Wright Park Riding Circle. You may park your vehicle at Wright Park Drive, which is directly across the Mansion. See map. By taxi cab -- just tell the cabbie to take you to The Mansion or even "Mansion House." Taxi rides cost about Php60.00 from Session Road. The elaborate main gate of the Mansion is said to be a replica of that at Buckingham Palace in London, England. Vehicles entering the compound pass through a great circular driveway and it is usually open only when the Mansion is used for an official function or activity. With its beautiful gardens and a well-manicured lawn, it is a favorite site for sightseeing and picture taking. Did you enjoy this page and find it useful? GET EVEN MORE FROM US!